Vintage Teacup and Saucer, English Bone China Teacup Trio, Floral Teacup Gift Set. 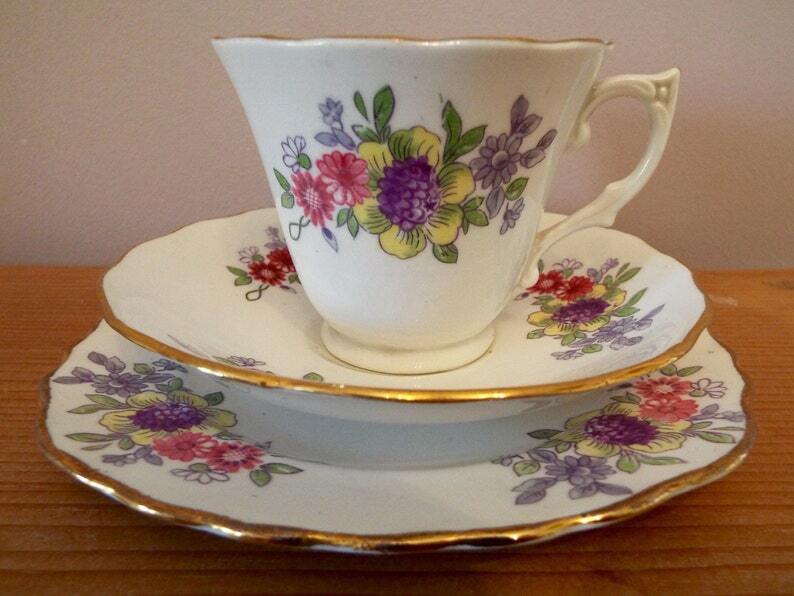 A pretty 1930s teaset for an afternoon tea party, baby shower or vintage wedding! A very pretty and unusual 1930s trio, simply marked 'English Bone China' on the base, with hand painted detailing. The pattern is on all elements of the trio and really pretty and delicate in design - perfect for a cup of tea in the garden on a sunny day! The teacup is also a pretty and dainty shape, with a really elegant handle which I think is very unusual. This little tea set would make a perfect thank you gift, or would be a lovely gift for a bridal or baby shower. Your trio will arrive beautifully gift wrapped in vintage style brown paper and pretty ribbon. In very good condition, no chips, cracks or crazing, and wear simply commensurate with age.